The question was put forth this past week, in a podcast where I was a panelist: Are sports video games in a golden age? "No," seems to be the most obvious answer. Ten years ago, we had competing simulation titles in college football, college basketball and in professional hockey at least, to say nothing of a viable rivalry in North America's premier sport, which brought out the best in both NFL 2K and Madden NFL instead of making both into clichés for Internet commenters. In those days, you got the simulation edition around the time of the real league's opening day, and then near the postseasons, arcade treats like NBA Ballers or NFL Street would show up. Console makers were pumping out their own titles in multiple sports, too, both Sony and Microsoft (even in tennis!) , and Sega, by virtue of the Dreamcast, hung on with a 2K sports line that survives today in a single title only. So, no, this is isn't really a golden age. It's more like one of contraction or retrenchment. Forget the fact that college basketball, a sport with a multibillion-dollar TV contract, has now seen two national champions crowned with no means to recreate or depose their reign in a video game. Go down the line:. 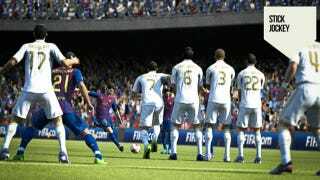 The most competitive video game matchup is FIFA and Pro Evolution Soccer both releasing Tuesday, with FIFA objectively dominant in reach, sales and in the key figure of licensed teams it features. This year, for the first time since it introduced the concept of the sports video game cover star, Madden NFL did not publish on the PlayStation 2. And yet the business of sports video gaming, which Madden symbolizes in the popular consciousness, still has one foot planted in the high development, licensing, and distribution costs of the PS2's generation. It accounts for the contraction we've seen, especially as game publishers—principally in EA Sports' 2K competition—have moved to philosophies of owning everything about the titles they publish. That doesn't mean the model of licensed sports video game publishing is doomed or its fans are consigned to buying boutique products. This past week NBA 2K13 revealed it would offer something called "MyTeam," a fantasy team-management mode with similarities to the "Ultimate Team" modes found in EA Sports' Madden, NHL and FIFA series. The concept is basically the same: Start with an assortment of real-world pros, play and win games to earn currency in a virtual economy, use that to improve and customize the team. It's been an extraordinary moneymaker for EA Sports, where past efforts like NFL Head Coach and Madden NFL Arcade or NFL Blitz—games requiring ground-up development—have not justified the production cost. The base modes of a simulation title represent the lowest margin product a sports publisher offers under a league license. That's why extending the license into arcade titles or secondary offerings has been such a concern—at least under the old model of console sports publishing. Lesser publication costs, lower barrier to gameplay, equivalent brand reach, same product price. It worked like hell in 2002, before games were distributed over console services and arcade-style sports titles were acceptable as full-priced disc releases. Today, that won't feed the bulldog. The inability to sell secondary titles as full-price releases is partly why 2K Sports is getting the hell out of baseball. What you're seeing now is not the offering of additional separate titles, but additional moneymaking modes within those titles. FIFA Ultimate Team; Hockey Ultimate Team, MyTeam in NBA 2K13, Madden Ultimate Team and Diamond Dynasty in MLB The Show. And if not these modes, with virtual economies and unlimited payment structures, then look at how the main modes of a console sports simulation have progressed. Sports video games now have at least four discrete forms of play—head-to-head, online head-to-head, team season and singleplayer career, with variants like online franchise and team-up play atop them. All of these modes, especially the RPG-like singleplayer career, are arguably entire games unto themselves. Madden's "Connected Careers," which strives to be a sports MMO with player-versus-coach action, probably is the best example. I'm also struck at how popular the EA Sports Season Ticket was overseas, because in the United States it seems to deliver so little value unless you play Ultimate Team modes, where you get a discount on purchasing virtual currency. Otherwise, you're paying 25 bucks for a weekend rental of a few sports titles you have to buy later. Then I realized that because of the staggered release dates, Season Ticket's "preview weekend" in North America, where the game comes out on a Tuesday, translates to nearly a full week for Europe for FIFA fans, making the £19.99/€24.99 cost more reasonable there—and much more profitable to EA. Football is the world's most popular sport, and this is the world's best-selling sports video game. Rather than build extra games to make a license profitable, sports publishers are concentrating efforts inside their existing titles, seeking to increase the reasons you'll buy it—and spend more money once you have it. This appears to be the way the industry will hang on until the next console generation, which everyone expects to deliver games digitally, and maybe bring us to an era of overhauling the engine every couple of years while updating the roster, or smaller features, through downloadable patches, acquired by a subscription. There may be fewer releases, but there are more products within the main game. It doesn't excuse the lack of competition. We are not in a golden age. But neither are we necessarily in a decline.